Catholic News World : FULL TEXT Interview of Pope Francis on Plane to Rome with Journalists "I have Christian hope." 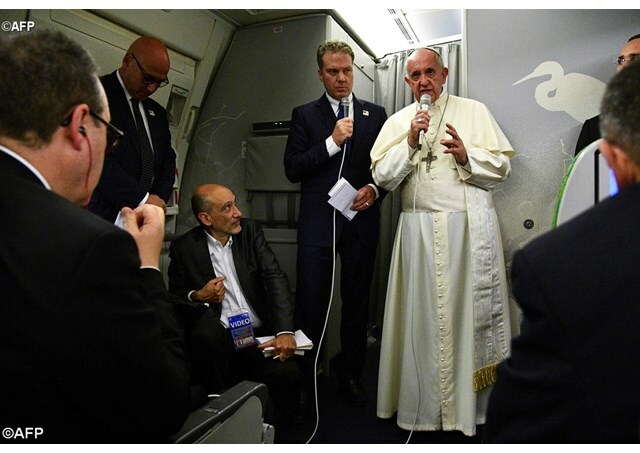 FULL TEXT Interview of Pope Francis on Plane to Rome with Journalists "I have Christian hope." Greg Burke: Thank you, Holy Father. First of all, thanks. You have chosen two interesting countries to visit. Two very different countries but with something in common, that is, in each of these countries is a small but very active Church, full of joy, full of young people and full of the spirit of service for all of society. We certainly have seen a lot, we have learned a lot, but we’re interested also in what you have seen and what you have learned. Pope Francis: Good evening, if we think of here, or good afternoon if we think of Rome, and thank you so much for your work… as Greg said, two very interesting countries, with very traditional, deep, rich cultures. For this, I think that your work has been very intense. Thank you so much. Pope Francis: It’s not the first time. I had said it publicly already in St. Peter’s Square, in an Angelus, in an Audience… and it was already known what I thought about this thing and what I had said. Your question is interesting because it brings me to reflect on how I seek to communicate. For me, the most important thing is that the message arrives and for this I seek to say the things, step by step, and listen to the answers so that the message may arrive. An example in daily life: a boy, a girl in the crisis of adolescence can say what they think but throwing the door in the face of the other… and the message doesn’t arrive. It closes. I was interested that this message would arrive, for this I saw that if in the official speech I would have said that word, I would have thrown the door in a face. But I described it, the situations, the rights, no one excluded, the citizenship, to allow myself in the private conversations to go beyond. I was very, very satisfied with the talks that I was able to have, because it is true that I haven’t, let’s say it this way, had the pleasure throwing the door in a face, publicly, a denouncement, but I did have the satisfaction of dialoguing and letting the other speak and to say my part and in that way the message arrived and to such a point did it arrive that it continued and continued and finished yesterday with that, no? And this is very important in communicating, the concern is that the message arrives. Often, denouncements, also in the media, but I don’t want to offend, with some aggressive (tactics) close the dialogue, close the door and the message doesn’t arrive. And you who are specialists in making messages arrive, also to me, understand this well. Pope Francis: Because it was replayed by TG4 and - I don’t know. I haven’t seen it, but some who are here have seen it - it’s a reflection that the message had arrived not only here. You have seen the front pages of the newspapers today. All have received the message and I haven’t heard any criticism. Maybe they are there but I haven’t heard them. Pope Francis: First distinction: evangelizing is not making proselytism. The Church grows not for proselytism but for attraction, that is for testimony, this was said by Pope Benedict XVI. What is evangelization like? Living the Gospel and bearing witness to how one lives the Gospel, witnessing to the Beatitudes, giving testimony to Matthew 25, the Good Samaritan, forgiving 70 times 7 and in this witness the Holy Spirit works and there are conversions, but we are not very enthusiastic to make conversions immediately. If they come, they wait, you speak, your tradition… seeking that a conversion be the answer to something that the Holy Spirit has moved in my heart before the witness of the Christians. During the lunch I had with the young people at World Youth Day in Krakow, 15 or so young people from the entire world, one of them asked me this question: what do I Have to say to a classmate at the university, a friend, good, but he is atheist… what do I have to say to change him, to convert him? The answer was this: the last thing you have to do is say something. You live your Gospel and if he asks you why you do this, you can explain why you do it. And let the Holy Spirit activate him. This is the strength and the meekness of the Holy Spirit in the conversion. It is not a mental convincing, with apologetics, with reasons, it is the Spirit that makes the vocation. We are witnesses, witnesses of the Gospel. 'Testimony' is a Greek word that means martyr. Every day martyrdom, martyrdom also of blood, when it arrives. And your question: what is the priority, peace or conversion? But when you live with testimony and respect, you make peace. Peace starts to break down in this field when proselytism begins and there are so many ways of proselytism and this is not the Gospel. I don’t know if I answered. Joshua McElwee (National Catholic Reporter) : Thanks so much, Holiness. A change of theme. During the Cold War, Pope Saint John Paul II said that the world policy of nuclear deterrence was judged as morally acceptable. Last month, you said to a conference on disarmament that the very possession of nuclear arms was to be condemned. What has changed in the world that led you to make this change? What role have the episodes and the threats between President Trump and Kim Jong Un had on your decision? What would you say to politicians that do not want to renounce their nuclear arsenals nor decrease them? Pope Francis: I would prefer if the questions on the trip were done first, I say this to everyone, but I'll make an exception because you asked a question. Now we'll do the questions on the trip, then I'll say something about the trip, and then the other questions will come. What has changed? Irrationality has changed (has increased). The encyclical Laudato Si comes to mind, the care of the created, of creation, from the time of John Paul II to all this many years have passed. How many? Do you have the date? (82) 82, 92, 2002, 2012...34 years. In the nuclear field, in 34 years it has gone beyond, beyond, beyond, beyond, and today we are at the limit. This can be a matter for discussion, it's my opinion, but I am convinced of my opinion: we are at the limit of liceity to have and use nuclear arms. Because today, with the nuclear arsenal so sophisticated, we risk the destruction of humanity or at least a great part (of it). This with Laudato Si. Pope Francis: Clever the question… eh.. good, good. But I would distinguish between the two meetings, two types of meetings. Those meetings during which I went to meet people and those in which I received people. This general asked me to speak. And I received him. I never close the door. You ask to speak and enter. Speaking you never lose anything, you always win. It was a beautiful conversation. I couldn’t say because it was private, but I didn’t negotiate the truth. But I did it in a way that he understood a bit that the path as it was during the nasty times renewed again today isn’t viable. It was a good meeting, civilized and also there the message arrived. Pope Francis: It won’t be easy to move ahead in a constructive development and it will not be easy for someone who wishes to go back. We are at a point where they have to study things. Someone - I don’t know if this is true - has said that the Rakhine state is one of the richest in precious stones and that possibly there are interests, being a land a little without people to work… but I don’t know if it’s true. These are just hypotheses that are said, also about Africa they say so many… but I believe that we are at a point where it won’t be easy to go ahead in the positive sense and it won’t be easy to go back, because of the awareness of humanity today… the fact of the return of the Rohingya, which the United Nations have said that the Rohingya are the most persecuted religious and ethnic minority in the world today. Well, this is a point that whomever has to go back must do so quickly. We are at a point there… that that dialogue… beginning with a step, another step, maybe a half step back and two ahead, but as human things are done, with benevolence, dialogue, never with violation, never with war. It isn’t easy. But is a turning-point. Is this turning-point being done for the good? Or is this a turning-point to go back? But yes, I don’t lose hope! But why? Sincerely, if the Lord has allowed this that we’ve seen yesterday, that we’ve experienced in a very reserved way, except for two speeches… the Lord promises something to promise another. I have Christian hope. And it’s known…. Valentina Alazraki (Televisa): On the trip, a question that we wished to asked before and then it didn’t go. We would like to know: a Pope that speaks about asylum seekers, refugees, immigrants every day… did you want to go to a Rohingya refugee camp? And why didn’t you go? Pope Francis: I would have liked to go. I would have liked to go, but it wasn’t possible. The things are studied and it wasn’t possible for various factors, also the timing and the distance… but other factors as well. The refugee camp came with a representation, but I would have liked to, that is true. But it wasn’t possible. Enzo Romeo (TG2) : Holiness, thank you. I would like to ask you two things quickly. One is on globalization: we’ve seen especially in Bangladesh, and it is a reason for the question tied to the trip, that the nation is trying to get out of poverty but with systems that seem for us quite tough. We saw the Rana Square, the place where the building that was used for industrial textiles fell. 1100 people dead. 5,000 wounded. For 60 Euros per day they worked and in our restaurant to eat a plat of pasta and a pizza cost 50 Euro. No this seems incredible, right? In your opinion, from what you have seen and what you have heard, is it possible to get out of this mechanism? And then another thing is this that we’ve all thought: on the issue of the Rohingya, it seemed that there was also the will to intervene by jihadist groups (Al Qaida, ISIS) who right away, it appears, tried to make themselves the tutors of this people, of the freedom of this people. It’s interesting that the head of Christendom has shown himself more a friend in some way than these extremist groups. Is this sensation right? Pope Francis: I’ll go from the second. There were groups of terrorists there who sought to take advantage of the situation of the Rohingya, who are a people of peace. This is like all the ethnicities, in all the religions there is always a fundamentalist group. We Catholics also have them. The military justify their intervention because of these groups. I try not to speak with these people. I try to speak with the victims, because the victims were the Rohingya people who on the one hand suffered that discrimination and on the other were defended by terrorists - and the government of Bangladesh has a very strong campaign, this is what I was told by ministers, of zero tolerance for terrorism not only for this, but to avoid other points - But these who are enrolled in ISIS are not Rohingya, but a fundamentalist, extremist, little group. But these make the ministers justify the intervention that has destroyed the good and the bad. Jean Marie Guenois (Le Figaro): So, today Burma is the nation from which you come… before this you went to Korea, the Philippines, Sri Lanka. It gives the impression that you are going around China. So, two questions on China: is a trip to China being prepared? And, second question, what have you learned from this trip of the Asian mentality and also in light of this project from China? What is the Asian lesson for you? Pope Francis: Today, the lady chancellor of the State of Burma has gone to Beijing. It can be seen that they are in dialogue there. Beijing has a great influence on the region, it is natural. I don’t know how many kilometers of border Burma has with (China)... also at the Masses there were Chinese who had come and I believe that these countries that surround it, China, also Laos, Cambodia, have a need for good relations. They are close and I see as wise, politically constructive, it can move ahead. It is true that China today is a world power. If we see it from this side it can change the picture, but it will be the political experts to explain it. I can’t and I don’t know. It seems natural that they would have good relations. The trip to China is not being prepared. Be calm. For the moment, it is not being prepared. But, returning from Korea, when they told me that we were flying over Chinese territory, I wanted to say something: I would so much like to visit China. I would like to. It is not a hidden thing. The negotiations with China are at a high level, cultural. Today, for example, in these days there’s an exhibition of the Vatican Museums there. Then, there will be one or there has been one, I don’t know, of the Chinese museums in the Vatican. There are cultural, scientific relations, professors, priests who teach in Chinese state universities. Then, it’s mostly political dialogue for the Chinese Church, with that issue of the Patriotic Church, the underground church, which must go step by step delicately, as it is doing, slowly… I believe that in these days, today, tomorrow a sitting will start in Beijing of the mixed commission. Patience is needed. But the doors of the heart are open. And I believe that a trip to China will do well. I would like to do it. James Longman (ABC): My apologies, I don’t speak any Italian. Thank you very much for having me on your-- I just want to ask if you have seen how much criticism Aung San Suu Kyi, and if you think that she received not having spoken enough about the Rohingya is fair. Pope Francis: I heard all that, I heard the critics, also I heard the criticism of not being brought to the province of Rakhine, then you went a half day, more or less. But in Myanmar it is difficult to evaluate a criticism without asking, was it possible to do this? Or how will be possible to do this? In this I don’t want to say that it was a mistake to go or not to go. But in Myanmar the political situation… is a growing nation, politically in growth, and a nation in transition, (made up) of so many cultural values, in history, but politically it is in transition and because of this the possibilities should be evaluated also from this view. In this moment of transition would it have been possible or not to do this or that other (thing)? And to see if it was a mistake or it was not possible? Not only for the State’s Chancellor, but also for the president, for the deputies, the parliament. In Myanmar, you always have to have the construction of the country in front (of you), and from there you take, as I said at the beginning, two steps forward, one back, two forward, two back…History teaches us this. I do not know how to respond in another way, (this is) the little knowledge that I have on this place and I would not want to fall into what that Argentinian philosopher did who was invited to give conferences to countries in Asia one week and when he returned he wrote a book on the reality of that country. This is presumptuous. Phil Pullella (Reuters): Yes, I would like to return to the trip if it’s possible. The meeting with the general was originally scheduled for Thursday morning. Instead you had to first meet Aung San Suu Kyi. When the general asked to see you first, the day of your arrival, it was a way of saying: I am in charge here, you have to see me first...in that moment did you feel that he or they wanted to manipulate you? Pope Francis: The request was because he had to travel to China. If these things happen in every case, if I can move an appointment I do it...I don’t know the intentions, but I was interested in dialogue. A dialogue asked for by them and which they came to, it wasn’t scheduled in my visit. And I think that the most important thing...it’s clear that the suspicion is exactly what you said: we are in charge here, we are the first. Pullella: Can I ask if -- you said that you cannot tell what is said in private encounters, but can I ask you if during that encounter you used the word Rohingya, with the general? Pope Francis: I used the words to get to the message and when I saw that the message was accepted, I dared to say everything I wanted to say. ‘Intelligenti pauca’ (Editors note: this refers to a Latin phrase meaning “few words are enough for the one who understands”). I thank you, because they tell me that it’s past time. I thank you for the questions and for all that you have done. And what does the Pope think about the trip: to me the trip does me well when I am able to meet the people of the country, the People of God, when I am able to speak, to meet with them and greet them, the encounters with the people. We have spoken about the encounters with the politicians. Yes, it’s true, it must be done, with the priests, with the bishops...but with the people, this...the people, the people who are truly the depth of a country. When I find this, when I am able to find it I am happy. I thank you for your help. And thanks also for the questions and the things that I learned from your questions.